Supplied: In three litre containers of peat-free compost, healthy and well established, approximately 150cms (5 feet) high, with full planting and aftercare instructions. This beautiful brightly coloured cultivar of the False Acacia is best seen during the summer period with its show stopping display of bright lilac-pink flowers appearing after the crab apple and cherry blossom has faded. 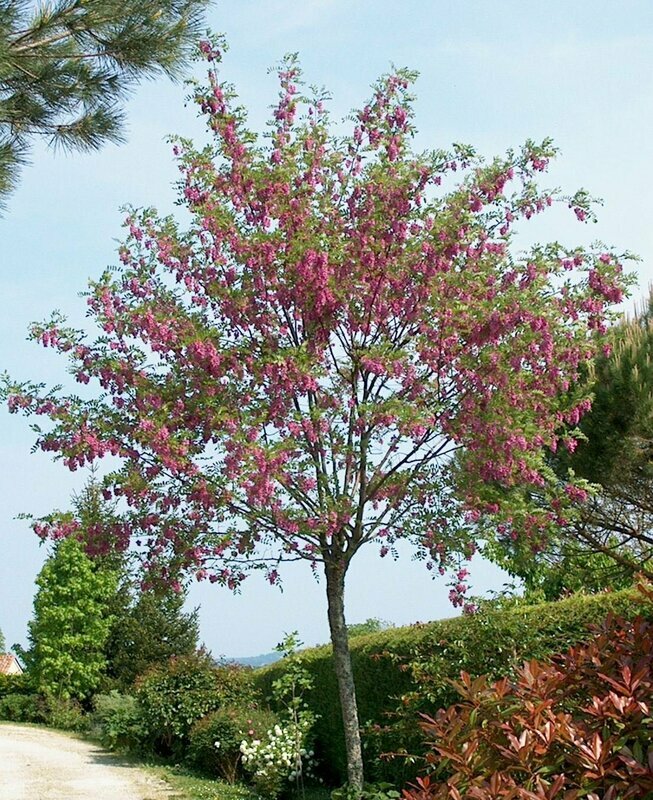 A magnificent small to medium size tree with a broadly rounded canopy when mature. The bright green foliage lightens its surrounds and provides the perfect backdrop to display wisteria like flowers. 'Casque Rouge' thrives well on any kind of soil but will require shelter from wind due to its brittle branches and soft leaves. Also able to tolerate urban pollution. Perfect for any garden to create a magnificent show of flowers and foliage throughout the year.